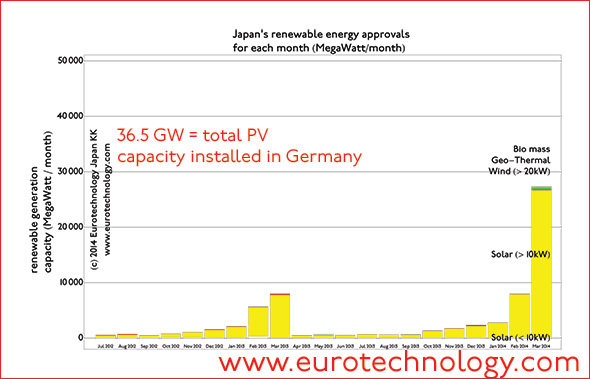 Japan’s renewable energy generation is overwhelmingly water power. The ratio of renewable power generation has decreased from 25% of total electricity generation in 1970 to 10% today. Extremely aggressive feed-in tariffs (FIT) for renewable energy introduced in July 2012 are showing first modest results to reverse this trend – initially solar energy projects dominate FIT projects, since solar projects are fastest to build. Larger projects, such as off-shore wind power, or geo-thermal projects, take a very much longer time to plan and build – on the order of 10 years or longer. This figure shows all electricity generation in Japan from renewable sources: Japan currently relies overwhelmingly on water power for renewable energy, which varies between 5% of total electricity in winter and around 12%-15% of total in summer, with an overall decrease since 2006. The figure shows that other renewable energy sources (wind, solar, geo-thermal and bio-mass) are still in the very early stages of development. Japan installed a considerable amount of both flow-type and pump-power hydro-power stations. (Pump-power hydro-power stations typically have a water reservoir with a dam at an elevated location, and a reversible generator/pump engine, which can act both as an electricity generator and as a pump, and thus act as giant batteries). With Japan’s focus on construction of nuclear power supply, development of hydropower ended in the 1990s. However, there is considerable capacity remaining to develop hydropower generation further in Japan, and in particular also small water power stations. Currently many local electricity enterprises build electric micro-power generation systems. Pump-power hydro-power stations typically have a water reservoir with a dam at an elevated location, and a reversible generator/pump engine, which can act both as an electricity generator and as a pump, and thus act as giant batteries. Pump-storage hydro power were developed as part of the network of large centralized nuclear and thermal power stations. The renewable energy mix approved under the FIT program is very different to Japan’s traditional renewable energy mix, which was predominantly large scale water power plants. Wind power generation is at a very low level in Japan compared to most other countries. With a large number of volcanoes and its location on the “ring of fire”, Japan has one of the highest potentials for geo-thermal power generation in the world. Japan developed geo-thermal power generation up until the 1990s, and then terminated development because of the focus on nuclear power plant construction. Japan’s installed bio-mass generation capacity is about 5 times higher than Japan’s developed geo-thermal capacity, see our news article “Japan biomass electricity generation booming“. We know of a few isolated experimental ocean power trials, but we are not aware of large scale projects.